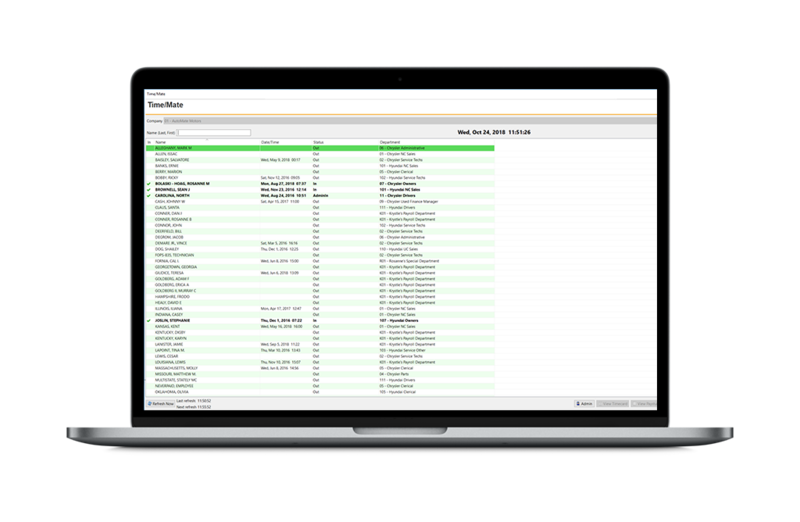 Easily and accurately process payroll across all your dealerships without the hassle of a third party. 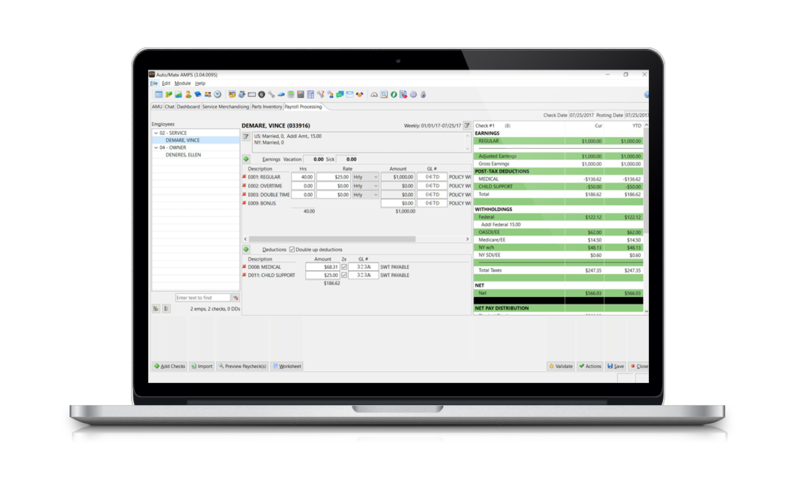 Auto/Mate’s Payroll module is a powerful and efficient time-tracking tool and processing application complete with time-saving features for employees who process payroll. Auto/Mate’s electronic time clock, as well as our service-to-payroll integration makes hourly and flat-rate tech time tracking seamless and automatic. Pay your employees easily and accurately with Time/Mate™. Our electronic time clock is included when you get Payroll. All hourly punched time seamlessly flows into Payroll, and reports show regular, double and overtime. Managers can also access the reports for a department-by-department view. Employees can easily punch in and out, as well as review all their time punches by accessing Time/Mate™ right in their taskbar. 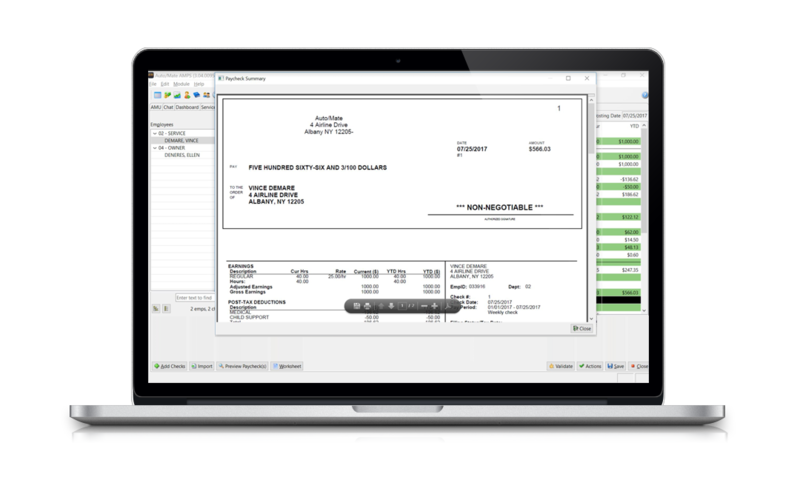 Streamline your payroll process with added flexibility. Payroll pulls in all hourly, salary and flat rates when you perform a payroll run. You can also select individual employees or specific departments you want to pay. We help minimize mistakes along the way by setting up validations that alert you of certain actions like exceeding maximum gross or identifying employees who weren’t paid. Payroll automatically uploads to the Accounting Module once the payroll run is completed and is archived for future reference. Better value and support than a third party. Why pay to use a third party payroll system that offers lousy support when your DMS provides a solution with support from real dealership experts? Troubleshooting and training is always easier when a real person who’s been in your shoes answers the phone and gives you answers when you need them.